Breakfast soup may seem like an odd choice to some, but in fact it is a common dish in cultures around the world. A humble bowl of soup is nourishing, satisfying, and quick – all features busy people appreciate for that first meal of the day – and can be easily made to conform to the requirements of many healing diets, including the autoimmune protocol (AIP). 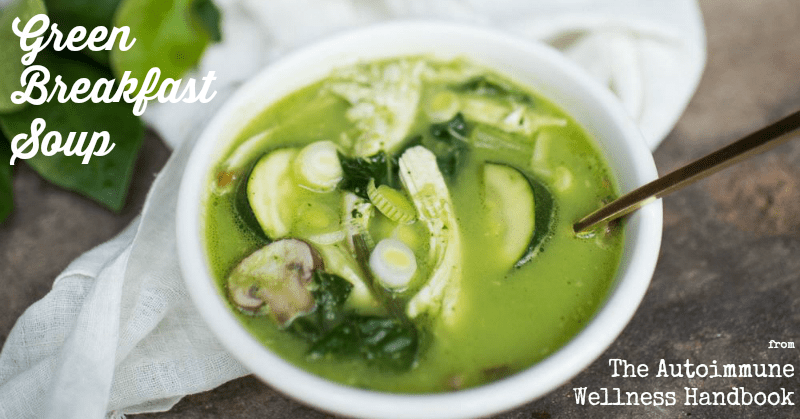 Today I am very excited to be able to share this healthy and delicious recipe from The Autoimmune Wellness Handbook, a brand new resource from my friends and blogging mentors, Angie Alt and Mickey Trescott. As a blogger who writes about health and food and healing diets, I receive a lot of paleo and gluten free cookbooks to review and share with my readers. As a cookbook addict, it has proven to be one of my favorite unanticipated perks (second only to the wonderful community of support it has lead me to, including all of you reading this!). I usually find something positive about all of the books and thoroughly enjoy reading and sampling the recipes from them. But this book is something entirely different. Yes, it includes some delicious recipes that I have already come to love in just the couple weeks since I received my advance copy and would be worth the purchase just for those alone. But I would be doing the book a serious disservice if I only focused on the food, as it is so much more… just as we do ourselves a disservice when we only focus on changing our diet to help us heal and ignore the rest of our lives. What makes The Autoimmune Wellness Handbook so great? Since I started my healing with food journey and this blog in 2013, I’ve been describing myself as someone who is “living well with Crohn’s disease.” I settled on that phrasing after rejecting the negative first language like “suffering from…” or phrases that position the body as an adversarial force like “battling…”. Angie and Mickey (who you may already know as the bloggers behind Autoimmune-Paleo.com) argue that in order to “live well” with chronic illness, you need to take a whole-body and whole-life approach. It isn’t enough to just avoid eating a list of foods, you have to look at all aspects of your life. They also recognize that “living well” looks different from person to person and reject the idea that some guru can provide a one-size-fits-all set of rules that will work for each of us. Therefore, their approach is guided by empowerment and self-discovery, recognizing that everyone is unique and has a different starting place and trouble areas, but that we can all benefit from a common set of steps to arrive at our personalized healing lifestyle. 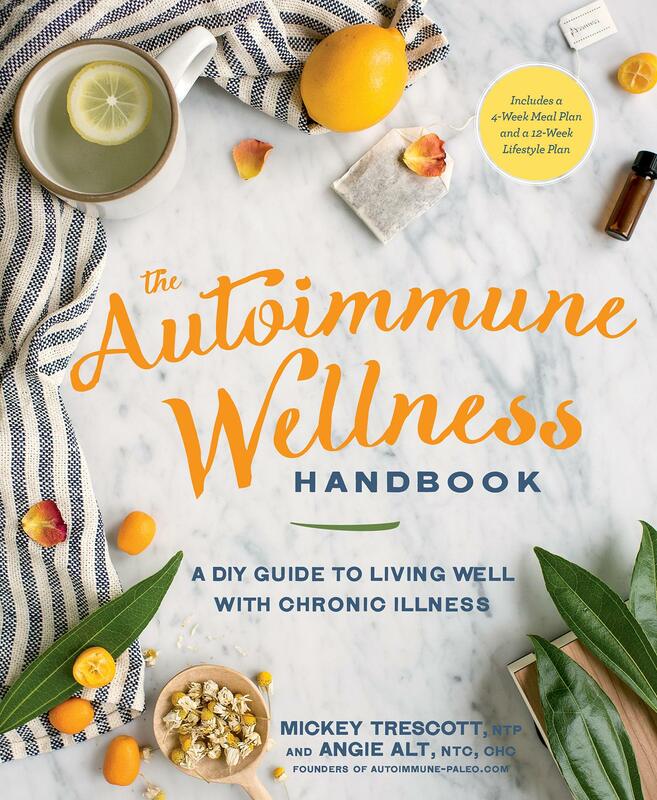 The Autoimmune Wellness Handbook is organized around seven key steps to wellness, starting with informing yourself and including collaborating with others, nourishing your body, resting, breathing, moving, and connecting. There is a chapter on each of these steps that includes self-assessments, checklists, and infographics to help you personalize your plan and bring it to life in easy-to-understand ways. Sprinkled among these are nuggets of Angie’s and Mickey’s personal experiences, so that you never feel alone in this journey. Each chapter ends with a “call to action” to help you put what you just learned into practice. After informing yourself about your diagnosis, Mickey and Angie argue that the most important thing you can do is to build a collaborative health-care team to advocate for and assist you with both the medical and non-medical aspects of healing. They describe the different types of conventional and alternative practitioners who can guide and assist you, including MDs, DOs, PAs, NDs, LACs, and the rest of the alphabet soup! Even more importantly, they provide advice on how to go about building this collaborative team in a world where practitioners even working in the same hospital or same practice often don’t communicate with each other, how to evaluate potential providers, what to do about conflicting advice, how to “fire” a provider, making big decisions about medications and surgery, and even tips on how to stretch your health care dollars. The first seven chapters are organized around the seven steps, then there is a chapter of recipes (which I’ll get to in a minute!) and finally a chapter devoted to a 12-week lifestyle plan to help you put all the pieces together. A different area of focus is introduced each week for the first four weeks, then four weeks of taking a new step each day, and then four weeks that coach you to gradually incorporating these practices into your daily life. This plan allows you to slowly adjust your schedule and your mindset rather than being suddenly forced to make a ton of changes all at once. Yes, that’s my favorite part too! And even if you only pick up this book for the recipes, you will think it worth the purchase price. There are 30 recipes, all of them compliant with the autoimmune protocol (AIP), and all feature simple, affordable ingredients. Most of them are also one-pot meals and batch-cooking friendly – making it easier for busy people or those with physical health challenges to pull off. There is also a four week meal plan and shopping list incorporating the recipes, for those who want to have everything laid out for them. 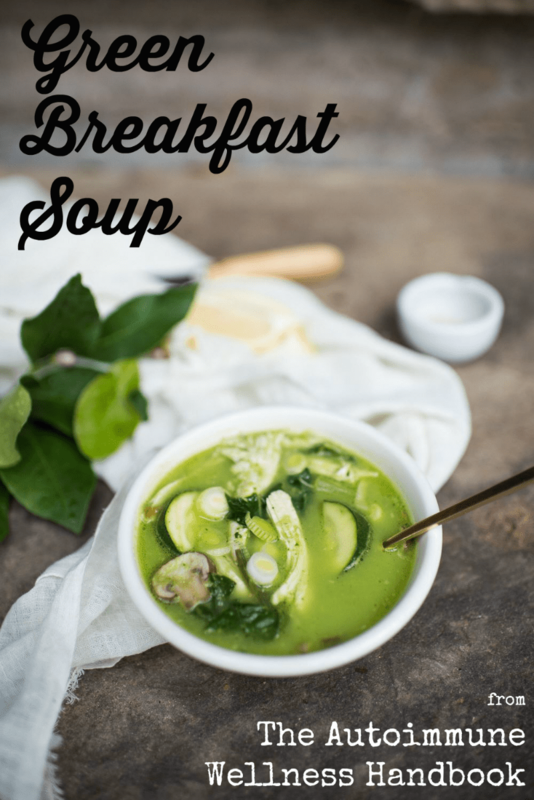 The first recipe I made after receiving my advance copy was the one for Green Breakfast Soup and I have loved eating it so much that I asked if I could share it with you. It takes a couple hours to prepare, so you’ll want to actually do it the day before you plan to eat it for breakfast, but it makes about 10 servings and freezes beautifully. I froze half of it right away and enjoyed the other half over the week. Enjoy! This for a nourishing breakfast soup will keep well for about a week in the refrigerator and also freezes well. Begin by cleaning the chicken (rinse it under cold water and remove loose bits of fat and other tissue). Place it in a large stock pot. If it doesn't fit, you will have to cut it into halves or quarters (kitchen shears help here -- start by cutting up one side of the backbone). Add the bay leaf, vinegar, and 1 tablespoon sea salt. Fill the pot with cold water until the chicken is just covered. Bring to a boil, and then cover tightly and lower the heat to a bare simmer. Cook until the meat is tender and falling off the bone, 60 to 90 minutes - the lower the simmer, the more tender the chicken will come out. Skim the surface of the broth to remove any scum that may appear during cooking. Remove the chicken from the pot and set aside to cool. Pour the broth through a fine-mesh strainer, being careful to save the broth in another pot! Discard the bay leaf. Place the empty pot back on the stove, add the solid cooking fat, and turn the heat to medium. When the fat has melted and the pan is hot, add the onions and cook, stirring, for 7 minutes, or until translucent. Add the garlic and ginger and cook, stirring, for another few minutes, until fragrant. While the onions are cooking, remove the meat from the chicken carcass, shred it with two forks (CAUTION: hot! ), and set it aside in the bowl. Keep the bones to add to your next batch of bone broth. Add the sweet potatoes and broth back to the pot, bring to a boil, and then cover and turn down to a simmer. Cook for 10 minutes. Add the zucchini, chard stems, and mushrooms, and cook for another 5 minutes, or until the vegetables are tender. Turn off the heat and stir in the chard leaves. Return the blended liquid to the soup pot, with the chicken. Add salt to taste. Serve each bowl garnished with green onions and a squeeze of fresh lemon juice. Love the idea of breakfast soup for a nutrient dense way to start the day! I got a lot of fat coagulating at the top. Does anyone else find it to have a “cheesy” flavor. Do these ingredients together cause fermentation? Just a peculiar flavor and not sure why. Could it be the ginger?